The long-awaited iPod Touch and iPhone app for Etsy was released on November 15th, 2011 by Etsy Inc. 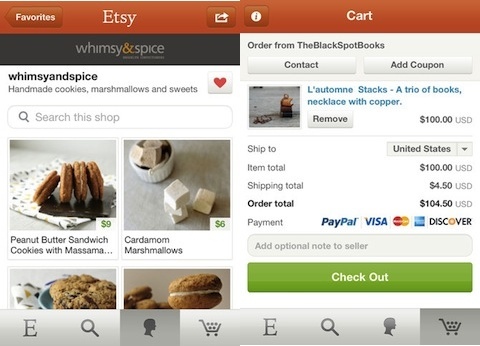 The Etsy app puts the crafty website in the palm of your hands, literally. With it you can browse, make purchases, or even list your items on the go with your iPhone or iPod Touch. The application has 4 tabs; The main menu where there are item suggestions and your Treasury Lists. There is the search tab, where you can browse by category or by item that you specify. Here, you can also narrow your search down further by price and location. Then, the notification tab that alerts you when an item you’ve bought has shipped. They also send alerts to your phone to notify you. Lastly, there is the check-out tab. Here is where you see the total, where you can make comments to the seller, and, of course, pay. This is the most streamlined I have ever seen a check-out screen. It shows the payment methods the seller accepts and how much the shipping will be. Etsy is extremely user friendly. Everything is clearly labeled and there is a button for help, if you need it. If you are new to Etsy, never having used the web site before, you’ll still be able to utilize the application with little-to-no problems understanding it. There are two things that would make this already great app , wonderful. There is no list of your selected favorites. You can favorite an item, by clicking the little heart button, but have no way of seeing what it is in the program. You would have to go to the website to see what those items were. While that is only a slight inconvenience, it’d go a long way. Another issue is the Treasury Listings. Treasury Listings are lists made by Etsy users from their interests and favorite items on Etsy. You cannot make the lists on here, but you can see them if they were made on the site. It’d be nice to see an option to add something to a list or to be able to create a new one. This is probably the most reusable iPhone app I have found. You can find nearly everything on Etsy and to have the portability of having it on your phone is amazing. This is a free download too so, completely worth while to get. This is a definite must have to any current or future Etsy user. 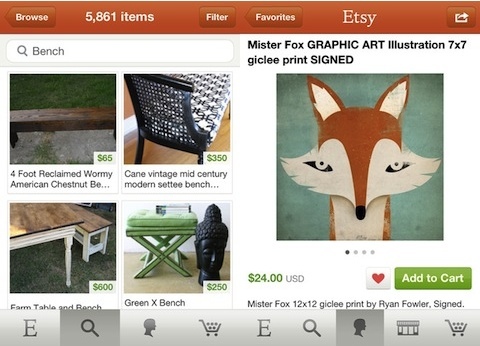 AppSafari review of Etsy was written by Joe Seifi on November 20th, 2011 and categorized under App Store, Free, Shopping. Page viewed 4966 times, 2 so far today. Need help on using these apps? Please read the Help Page.